A high-fat breakfast is now thought to be the best dietary approach to getting lean and staying shredded – that’s why we created this awesome paleo breakfast fry-up! The first meal of the day is thought to program your metabolism for the rest of the day. If you start the day with a fat-rich breakfast, researchers have found that your body will utilise your fat stores for energy throughout the day. If you start the day with a traditional carb-heavy breakfast, such as oats, cereal or granola, your body will preferentially burn the carbohydrates you eat for energy rather than burn body fat. Therefore, this breakfast is perfect for those wanting to burn fat, whether you’re a devout paleo practitioner or not. This paleo breakfast recipe is packed with healthy whole-food ingredients, plus it packs a powerful protein punch. On top of the protein, the salmon is also rich in heart-healthy Omega-3 fatty acids. Try to get wild salmon if your budget allows, as it’s leaner and will have less contaminants (such as mercury) than farmed salmon. The coconut oil is perfect for a fry-up as it doesn’t break down at high temperatures and contains lots of healthy MCT saturated fats. Note: You can buy similar seasonings as all-in-ones from some supermarkets, although be aware that they usually have added sugar. Some tasty ready-made seasonings include Schwartz Perfect Shake ‘Chicken’ and Morrison’s Smoked Paprika & Red Pepper Rub. If you’re making the seasoning from scratch, mix all of the ingredients together in a bowl. If you’re using a ready-made seasoning, add a tablespoon into a bowl. Get your salmon out of the packet and add it to the bowl containing the seasoning. Mix it all up until the salmon is coated with the seasoning on all sides. Get a large non-stick frying pan out and put it on a medium heat. Add the coconut oil to the pan, and once the oil has melted, throw in the salmon. It should take about 5 minutes per side to cook the salmon. 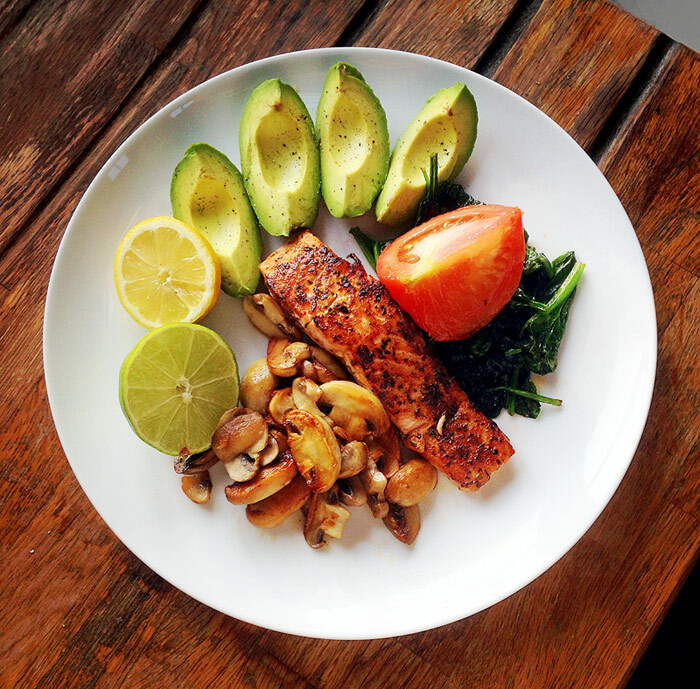 Meanwhile, slice up your mushrooms and tomato, and add them to the pan alongside the salmon. Give them a good stir to coat them in the coconut oil, and remember to give them another stir every couple of minutes so they cook evenly. Once you see the salmon has cooked about halfway through (it should have turned a pale pink colour where it is cooked), flip the salmon over to cook the other side. By this point, the salmon should only have a couple of minutes left, so chuck in your handful of spinach, making sure to move it around the pan so it wilts evenly. Finally, peel and slice your avocado. Place it on a plate, then add all of the ingredients from the frying pan. Grind over some black pepper and squeeze the juices of the lemon and lime over everything. That’s it – all that’s left to do is take a quick picture (upload to Twitter/Instagram & tag us @TrainEatGain) and then tuck in!